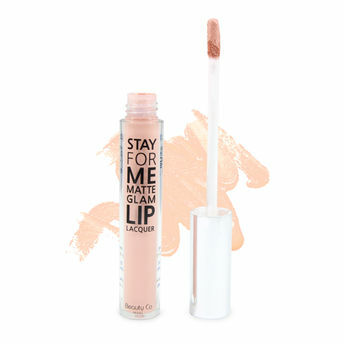 Stay For Me Matte Glam Lip Lacquer is a must-have in any woman's makeup kit. It produces flawless results and helps you look your best, every day. With a special applicator wand built-in, you'll have rich, vivid lips in half the time it takes to apply conventional lipsticks, lip creams, and lip stains. It is highly pigmented and wax-free so you get vibrant colour along with a light, breathable skin-feel. It is designed to dry quickly so you can apply it on the go with no worries! It's special formulation also makes it resistant to smudges ensuring your lips look their luscious best always! Additional Information: Introducing a Korean Beauty Brand selling amazing cosmetics and makeup products. Beauty Co Seoul brand brings to you innovative every day skin care products that suit all skin types, along with offering bold vibrant color cosmetics that are innovative, long lasting and in-trend! Alternatively, you can also find many more products from the Stay For Me Moist Glam Lip Lacquer range.